Nina and Miodrag Stanković, 2011. 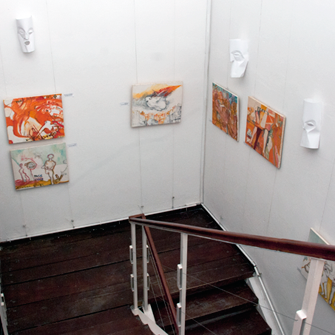 STEPENIŠTE Gallery is a visually interposed entity - by space that occupies, as well as by its concept. That is the place for investigation and dialog between culture, history and education (skills, processes and knowledge of art, history of art and theory of art as a form) on one side and exploratory adventure of artist who creates while searching for his identity in relation to personal perception of his environment. Even though STEPENIŠTE is visually central communication area in Šumatovačka, it was put aside regarding main - program activities of the Center. Until now that is - when it became a place for presenting artworks. Now that STEPENIŠTE for the first time in history of Šumatovačka adopted a new, added role besides its own basic, it has a tendency to become a conveyor of various meanings or texts: clear, obvious, but also of those metaphoric and symbolic ones. Art is in fact a product of common intentions. The moment when one work of art is being created, is by final analysis a social moment and mystery. Objects, installations and events are human or social products which establish or carry certain meanings which don’t belong exclusively to the artist or artwork. In the process of representation, a creative act is being initiated between reference content and meaning produced by work of art. STEPENIŠTE as a work of art itself, becomes a creator, an agent or an inspiration for another work of art which is „artistic“ in regard to public metatext of culture or interconnected with cultural metatext. Unfortunately, STEPENIŠTE and First-floor Studio still remain inaccessible to people bound to a wheelchair even if all Šumatovačka curriculums are inclusive. In this sense, we are being witness of problem with disability of one social community. Since everything we do or say is never unintentional and has consequences in the long terms, Šumatovačka tried to partially transform existing function of one of the most beautiful Belgrade gardens and created an open exhibiting area and opened for everyone-VRAČARSKA BAŠTA (Vračar Garden) GALLERY. 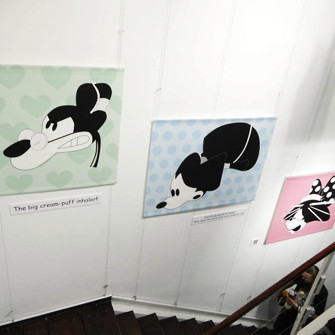 SCHLITZ Comics Workshop (ŠLIC strip) exhibition, 2011.